We plant over half a million trees every year. We call our tree farms working forests. One reason for this is that our crop works as it grows. Trees grow many, many years before they are ready to be harvested, while they are growing they are working to clean our air and water. The forest also changes shape as it grows providing a different type of habitat for a diverse array of plants and wildlife over time. Growing trees is our main business, let’s take a closer look at the timeline of a Green Crow tree farm. Immediately following harvest the land is prepared to be replanted. Preparations are tailored to the site. General techniques include mechanical brush and debris removal, slash piling and burning, and when necessary chemical control of competitive vegetation and noxious weeds. Tree planting typically occurs in the late winter and early spring time. We take care to plant the next crop with healthy seedlings from superior family lines selected for the specific growing conditions and based upon the historic species composition of each unit. To give our crop the best start possible, we plant about 435 seedlings per acre. We pay a lot of attention to our crop in the first few years by conduction survivorship surveys. The initial survey usually occurs in the fall after the crop’s first full growing season. Sometimes some of the trees don’t live through the summer because of drought or animal damage. Survivorship surveys help us decide whether to replant areas within a unit, interplanting, the following spring. We protect our investment by making sure our crop has the competitive advantage. During the first three years after planting this might mean using chemical weed control to insure our trees are not shaded by invasive plants. Mechanical brushing may also occur before our crop reaches crown closure, about 4-10 years old, to reduce the competition for sunlight, nutrients, and water from unwanted woody plants. Pre-commercial thinning is a technique we use to reduce the competition within a plantation between our crop trees. When the trees reach crown closure, 10 – 20 years, the plantations are assessed for need of pre-commercial thinning (PCT). Natural seeding can occur during the early years of crop development. 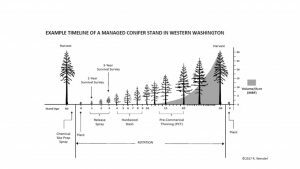 At increased densities inter-tree competition can reduce the overall stand growth potential. Crops that need PCT are thinned to a residual density between 300-450 trees per acre. Our forest management professionals must consider many factors to determine when to harvest, where and how much to harvest year to year as part of our sustainable management plan. Our harvest schedule is based on the combination of the age and spatial location of each stand. We protect fish and wildlife habitat with uncut riparian buffers and limiting the size of continuous harvest blocks. The age at harvest, also called the rotation age, of a working forest varies with species composition and site productivity. The rotation age is also influenced by where the timber goes once it leaves the forest. There is no specific age for harvest but the typical rotation age of about 40 years produces logs suitable for domestic mills as well as export. Our foresters keep a close eye on the growth our tree farms with periodic re-sampling of the stands (cruising) to measure growth and log volume. We replant every stand we harvest! Remember, growing trees is our main business.